Dolly was the star of ABC's Good Morning America Tuesday, snagging a more than seven-minute interview featuring a couple of Internet-submitted questions from Dollymania readers, a two-minute segment with audience questions, an amazing live acoustic performance of "Jolene" and live performance of "Celebrate The Dreamer In You." Watch the interview in the above media player or by clicking here. The below media players feature footage of "Jolene," "Celebrate The Dreamer In You" and audience questions. They also posted a poll here of viewers' favorite Dolly song. AOL's "TV Replay" also posted a clip of her greeting the show's host in the bottom player below. Immediately afterward, she popped in on The Gayle King Show on Oprah Radio, where she plugged the upcoming Hallmark Channel special and 9 To 5: The Musical tour. (Listen here.) She was scheduled Tuesday night for appearances on Access Hollywood and The Late Show With David Letterman. Wednesday has the previously-announced stop by Live With Regis And Kelly plus appearances (announced Tuesday) on FOX News' Fox & Friends and Fox 5's Good Day New York. USA Today on Tuesday profiled the pet accommodations offered by Dollywood and Disney. Check out what they had to say here. Don't forget to watch Dolly all over the tube on Tuesday with stops by Good Morning America, Access Hollywood and The Late Show With David Letterman, followed by a Wednesday appearance on Live With Regis And Kelly. The appearances are to promote Saturday's Hallmark Channel special. It was also announced Monday that she'll be a guest on XM Sirius satellite radio's Gayle King Show on Oprah Radio at 10:30 a.m. Eastern Tuesday. Finally, check out an interview with The Pittsburgh Post Gazette about the park and her life in advance of the special here. After three weeks on the charts, Sony U.K.'s three-CD "Original Album Classics" reissue of Dolly's Eagle When She Flies, Slow Dancing With The Moon and White Limozeen falls this week off the British top 20 country albums chart, down from No. 19. On the other side of the globe, The Very Best Of Dolly Parton, Vol. 1, the label's 2007 foreign compilation, slips another spot on the Australian top 20 country tally, coming in at No. 17 in its 61st week Down Under. Got A Query For Dolly? Dying to ask Dolly a question? Well, ABC's Good Morning America is seeking viewer suggestions of what to ask her when she stops by for an interview and to perform on the program next week. Submit your query here! And don't forget, as was first published on this website nearly two weeks ago, Dolly is making several appearances in coming days: Good Morning America, Access Hollywood and The Late Show With David Letterman on Tuesday and Live With Regis and Kelly on Wednesday. These are in advance of and to promote the previously-announced 8 p.m. Eastern July 3 Hallmark Channel special Dolly Celebrates 25 Years Of Dollywood. (Check out another story about the special from The Knoxville News Sentinel Friday here.) Also new this week are announcements that The Oprah Winfrey Show will on July 2 re-run her appearance from a few weeks ago to promote the special, and Hallmark is making sure everyone gets into the spirit of Dolly that weekend with special airings of A Smoky Mountain Christmas at 10 a.m. July 3 and again immediately after the special that night at 9 p.m. The special itself is scheduled for repeat broadcasts at 11 p.m. that night as well as 8 p.m. and 11 p.m. on the Fourth of July. Publicity image by Alexx Henry/2010 Crown Media United States and courtesy Hallmark Channel. 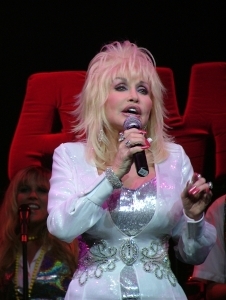 Spinner magazine has compiled its critics' list of the top 77 most "unforgettable" songs from films, and Dolly shows up both as a singer and songwriter. At No. 35 is her Oscar-nominated theme song "9 To 5," and No. 16 is her composition "I Will Always Love You" as performed by Whitney Houston. Also, although not mentioned directly, the critics note how shocked everyone was when Three 6 Mafia won the Oscar for "It's Hard Out Here For A Pimp" (No. 31 on the tally) � of course, nearly all Academy Award observers has said they expected Dolly to win that year for her "Travelin' Thru." Read the full list here. Although I bet most readers of this site already bought it for 99 cents when it first came out back in February, it was announced Friday that the "Dolly App" for iPhones and Droids has gone free. You may download it here. Thanks to Kayla for sending in a few shots of Dolly in her park tour parade from KidsFest the other weekend. You may check them out in that section of the site here. Video from Dolly's appearance at the Rotary International convention in Montreal Wednesday was made available on the Rotary.org website Thursday. While not her complete remarks, you get a flavor for what she had to say. Watch it in the media player above or by clicking here. Looks like Dolly's long-talked-about dance CD might not be dead. Mixer Allen Morgan has taken to mentioning it again in his press interviews, including noting it in a story with Toon Track here. Thanks, Tony! As the time nears for Dolly's Hallmark Channel special on July 3, media mentions of it are increasing. Check out notes from Knoxville News Sentinel via Scripps News here and Zap 2 It TV blog here. Steve Martin's The Crow - New Songs for the 5-String Banjo, featuring a Dolly collaboration, jumps up four spots to No. 3 bluegrass albums in its 69th chart week, the July 3 tally released by Billboard on Thursday showed. On the overall charts, Lady Antebellum's Need You Now holds steady at No. 1 country and No. 8 pop in its 21st week, while The Zac Brown Band's The Foundation rises two to No. 2 country and No. 12 pop in its 83rd chart week. I didn't see video footage of her speech posted yet, but Rotary.org on Wednesday provided a written story about Dolly's appearance before the organization's international convention in Montreal, Canada, noting she performed "9 To 5," cited the Club's Four Way Test, spoke about her international literacy efforts and was named a Paul Harris Fellow. Read it here. Also, CTV conducted an interview with her from the convention, available here. Thanks, Brad! Dolly's Imagination Library literacy program, while celebrating 25 million books internationally since inception, has also passed a milestone in its home state, Tennessee. According to reports Wednesday, the project, which is offered statewide there, has distributed 10 million books to the state's children. Read more from The Tennessean here. In related news, Carter County, Tenn., this week celebrated its 100,000th volume, TriCities.com noted here and The Johnson City Press here. While she wasn't there in person, Dolly sent video greetings to the crowd gathered for the Nasville Rising flood relief concert organized by Faith Hill and Tim McGraw. "Nashville Rising is just another way to say, `Love thy neighbor,'" she said. Coverage is available from The Associated Press here, CMT here and GAC here. A new Dolly tribute tune, "Little Butterfly," is available for download, its singer and composer tells me. Malcolm Link, a Dollywood performer, has released the song via British music site Arkade.com. It costs about $1.50 per download, and all proceeds benefit the Imagination Library. Check out a preview and consider downloading it here. You may have heard the story that Kylie Minogue recorded her last album using a "Dolly test," that if a song sounded good if she tried it out in the style of Dolly, then it was good enough for her to record in her own style for the CD. Well, Dolly fans The Scissor Sisters were on BBC One Live Lounge Tuesday and decided to offer one of Minogue's new songs, "All The Lovers," as a country ditty in "Dolly's style." Check out a clip here. Thanks, Jason! The dog that plays the president's dog in the film First Dog, an indie film that contains several original Dolly songs written and performed by her for the project, actually belonged to a former president, The Hollywood Reporter noted in a story Tuesday here. The film's writer/director, Bryan Michael Stoller, obtained the puppy after seeing him in a coffee shop. Turned out, he belonged to Nancy Reagan and her daughter, Patti Davis, but he wasn't getting along with Davis's cats and was too rambunctious for the former first lady, whose husband was bed-ridden and near the end of his life at the time. Five years later, that connection inspired him to write the story of the president's dog getting separated from him while touring the country, eventually being returned to The White House by a little boy who finds him. Dolly is up in Canada today, where she will deliver a morning keynote address on the Imagination Library to the Rotary International convention in Montreal. I would expect her remarks will probably be posted sometime thereafter on the organization's website here. Sony U.K.'s three-CD "Original Album Classics" reissue of Dolly's Eagle When She Flies, Slow Dancing With The Moon and White Limozeen from May slips three to No. 19 in its third week on the British top 20 country albums chart, it was announced Monday. Check out a story on Dollywood's 25th anniversary season from The Herald Times in Bloomington, Ind., here and a note about the July 3 Hallmark Channel special on the milestone from music blog The 9513 here, which also features a contest to win tickets to the park. Your Dollymania Video News Report of Dolly's KidsFest appearances at Dollywood is now available in that section of the website here. A few more things from that weekend are still to come! The Very Best Of Dolly Parton, Vol. 1, the Sony greatest hits collection from 2007, declines one spot this week on the Australian top 20 country tally, coming in at No. 16 in its 60th week Down Under. Thanks to Jason for alerting me that Dolly is all over the two most recent issues of Country Weekly. Last week's (with Brad Paisley on the cover) features a publicity shot from the Hallmark Channel of her with a birthday cake for Dollywood's 25th season. This week's (with Dierks Bentley on the cover) has a shot from the Hallmark taping of her with Billy Ray, Kenny and Miley as well as a "Flashback" to her 1999 induction into the Country Music Hall of Fame and a shot of her for a piece about her recent Oprah appearance. He also noted that People Country has a shot of her and Kenny Rogers from his 50th anniversary special taping plus an early '80s shot of her for a Laura Bell Bundy article about how she based her "Giddy On Up" video on Dolly's film portrayal of the madam Miss Mona. A selection of shots from Dolly's KidsFest park tour at Dollywood have been added to that section of the site here. Still to come are a video report and pictures from the park's new vacation cabins. The full press release for Dolly's "Backwoods Barbie-Q II" fund-raiser auction for the Dr. Robert F. Thomas Foundation was issued Friday via BusinessWire. Read it here. As was reported here earlier this week, the auction takes place Aug. 14 and $200 tickets are available from Amy Kingery at (865) 446-9628. Lady Antebellum has achieved a feat no one else has done since Dolly: have a No. 1 country song show up on the Dance Club Play chart, Billboard noted here Friday. The magazine reported that a remix of the band's "Need You Now" lands at No. 45 on the tally, marking the first country chart-topper to show up on the chart since Dolly's "9 To 5" made it to No. 77 in 1981. Back then, the chart had 100 spots, but now it only counts the top 50. Steve Martin's The Crow - New Songs for the 5-String Banjo, with its Dolly guest spot, regains one to No. 7 bluegrass albums in its 68th chart week, the June 26 numbers released Thursday by Billboard showed. On the overall charts, Lady Antebellum's Need You Now holds steady at No. 1 country and slips four to No. 8 pop in its 20th week with 39,000 copies sold, while Dierks Bentley's Up On The Ridge debuts at No. 9 pop with 38,000 units moved in its first week and climbs to No. 2 country, up from an early No. 65 debut the previous week, likely due to street date violations. Don't know what she was in the studio recording, but thanks to Tony for alerting me to some photos from earlier this month of Dolly at Sound Kitchen Studios recording with producer Kent Wells. Check them out here! Check out this great web section dedicated to Dolly with video, photos, interviews and stories from Knoxville TV station WATE here. Apologies in advance if an update or two are missed. My home Internet modem died Wednesday night, which is why there was no update that night, so updates may be a little sporadic for a few days until it is replaced. Here's what everyone's been waiting for: Each year, Dolly donates a spectacular item for the Dr. Robert F. Thomas Foundation's annual Evening of Elegance fund-raiser, last year topping all past offerings with her "Backwoods Barbie-Q" that allowed two auction winners to spend the night at the guest cottage of her Tennessee Mountain Home, get a private breakfast cooked and served by Dolly herself the next morning and invite 10 friends for a tour of the home and a private barbeque dinner and concert with her. The package last year brought in a record-breaking $75,000 at the auction, so fans have been wondering what in the world could she do to top it this year. Turns out, they're going to do it again! Dollymania is pleased to reveal that the top auction item for this year's gala, which takes place Aug. 14 in Gatlinburg, will be Dolly's "Backwoods Barbie-Q II." In making the announcement, Dolly noted: "I never in my wildest dreams imagined anybody paying $75,000 to eat supper with me. Due to the generosity of some real fine folks, we raised a lot of money for the Dr. Robert F. Thomas Foundation, which is very near and dear to my heart. So I'm offering up my Backwoods Barbie-Q II this year with hopes that we can raise a lot more money to help improve healthcare in Sevier County." "Dolly absolutely wowed last year's winning bidders with a truly once-in-a-lifetime experience at her Tennessee Mountain Home," said Thomas Foundation Executive Director Deborah Dowling. "Dolly exceeded everyone's expectation, as she always does, so we know going into this year's auction that the Backwoods Barbie-Q II is a rare and much anticipated event that will be highly sought after at our Evening of Elegance event." Auction winners Tabitha Hall and Sabrina Taylor said the event was well worth the price tag. "It was beyond incredible," Hall explained. "To see Dolly's Tennessee Mountain Home through her eyes was beyond my expectations." Taylor added: "We pushed our plates back, sat on the lawn and swapped stories with one of the best storytellers in the world. The Backwoods Barbie-Q was a moment in time that we'll never forget!" The Evening of Elegance takes place at the Mills Auditorium in Gatlinburg at 6 p.m. Aug. 14. Tickets, $200 each, are required for participation in the auction and are available from Amy Kingery at (865) 446-9628. The Dr. Robert F. Thomas Foundation was created in 1983 in honor of the country minister/doctor who arrived in Sevier County in 1926 to care for its residents. His duties featured healing the sick and delivering baby after baby, including Dolly herself in 1946. Today, Dolly serves as honorary chairperson of the Foundation, which works to expand the range and quality of health care services available in the county, including the construction of the new LeConte Medical Center in Sevierville, which features the Dolly Parton Birthing Center and Dolly Parton Center for Women's Services. Photo at top is of the auction winners and their guests at last year's Barbie-Q with Dolly, and photo at the bottom is of Dolly at a special preview of the Dolly Parton Center for Women's Services prior to its opening to the public. Both images are by Curtis Hilbun and were provided by the Dr. Robert F. Thomas Foundation. The next galleries from Dolly's KidsFest opening appearance last week at Dollywood, this time on the presentation of the 25 millionth Imagination Library book, have been added to that section of the site here!�More to come! Sony U.K.'s three-CD "Original Album Classics" reissue of Dolly's Eagle When She Flies, Slow Dancing With The Moon and White Limozeen from May gets a second week on the British top 20 country albums chart, gaining two to No. 16, it was revealed Monday. Dolly's Imagination Library chapter in Bismarck, N.D., is profiled by TV station KXMB here this week. Dollywood will soon reveal details on its 2011 ride addition, which PR director Pete Owens teased with a hint that it "is an attraction that could deliver the mail" in a podcast last week with Coaster Crew here. Thanks, Jonathan! "We've kinda been a little busy around here this year," Dolly said as she welcomed everyone to the eighth annual KidsFest at Dollywood on Friday. She recounted her recent trip to The Oprah Winfrey Show, the upcoming Hallmark Channel special on the park's anniversary season and her Nashville flood relief fund-raising efforts. In presenting the annual Dolly Parton Chasing Rainbows Award to a teacher who has overcome adversity to inspire his or her students, Dolly first recalled two special teachers in her life, Archie Ray McMahon and Julia Householder, and thanked teachers for the impact they have on children. David Dotson, president of the Dollywood Foundation, introduced the honoree saying that the classroom of Keil Hileman, a sixth and eighth grade history teacher of Kansas, is "an interactive heaven" where a classroom museum exists of more than 20,000 artifacts to bring history to life. At one point in his life, he was told he'd never walk again, but he walks today. He was told at one time that he may lose his sight, but he can see. He was told he may not be able to have children, but he has three daughters. Dotson noted that one student described him as "he not only opens up our hearts and minds; he frees our spirit." "I can't tell you what it means to my family and my students back home," Hileman said accepting the award, adding his own praise for Dolly's Imagination Library efforts in literacy. Next, she brought on stage Birmingham, Ala., 4-year-old Kumar Stewart, saying, "Of all my dreams for the Imagination Library, well, they can be captured in this one little person." Stewart, with his family, was presented with a special supersized edition of Dolly's children's book I Am A Rainbow as the program's 25 millionth book, followed by her singing for him the park's 25th anniversary season theme song, "Celebrate The Dreamer In You," and a media Q&A. Her only other public appearance of the day was a park tour later that afternoon. Audio of her remarks and the first couple of full photo galleries have been posted to that new section of the site here. Much more to come! (We stayed in an amazing cabin on this trip courtesy Dollywood Vacations. Highly recommended!) Image is copyright � 2010 T. Duane Gordon/Dollymania.net. May not be reproduced without prior written consent. Sony's foreign compilation disc from three years ago, The Very Best Of Dolly Parton, Vol. 1, remains steady this week at No. 15 Down Under in its 59th week on the Australian top 20 country chart. Dolly on Friday celebrated the start of KidsFest at Dollywood in grand fashion by giving away some goodies to deserving recipients. At a ceremony in the park's Showstreet Theatre, she presented the 25 millionth book in her Imagination Library literacy program to Birmingham, Ala., 4-year-old Kumar Stewart: an autographed oversize version of her book, I Am A Rainbow. She also presented the Dolly Parton Chasing Rainbows Award to Kansas sixth and eighth grade history teacher Keil Hileman. She also took questions from the press. Look for more details here in Sunday night's update, and check out additional coverage from The Knoxville News Sentinel here and WBIR here. Also, rumor is the public will see her around the park again on Wednesday as she films segments for NBC's Today show. Image is copyright � 2010 T. Duane Gordon/Dollymania.net. Click on it for a larger view. May not be reproduced without prior written consent. Dollywood's eighth annual KidsFest, the South's largest children's festival, kicks off Friday with appearances by Dolly on the park that day. The seven-week event features the return of roving characters, the Imagination Library Playhouse with the Penguin Players and Journey To The Center Of The Earth 4D ride. New this year is a rotating schedule of performers in the "Adventure Theatre" (Showstreet Theatre): percussionists BAM! Friday through Sunday, Paper World Show by Mimirichi June 15-20, juggler Mark Nizer June 22-27, magician Curtis Adams June 29 - July 4, Gazillion Bubble Show July 6-11, jugglers The Passing Zone July 13-18, Star Trek Live July 20-25 and ventriloquist Kevin Johnson July 27 � Aug. 1. And watch Today on NBC Friday, as she is supposedly to appear on the show! The next set of shots from correspondent Harrell Gabehart of Dolly's Nashville flood relief weekend are now available in that section of the site here. Still more to come! Reba McEntire extends her top 10 singles lead over Dolly with "I Keep On Loving You" advancing two to No. 10 on the country singles tally, giving her 58, the record for a female artist, compared to Dolly's 55. Dolly held the record for a total of 21 years before Reba passed her last year. In 2006, she had tied Dolly but Dolly pulled ahead later that year. In 2007, Reba tied her again, pushing ahead in 2009. This marks Reba's second top 10 hit after taking the record on her own. She still tops Reba for No. 1 country singles, 25 compared to 22. In other chart news, the June 19 Billboard charts show Steve Martin's The Crow - New Songs for the 5-String Banjo, featuring a Dolly collaboration, falling two to No. 8 bluegrass albums in its 67th chart week. Lady Antebellum's Need You Now holds onto the No. 1 country and No. 4 pop in its 19th week, while The Zac Brown Band's The Foundation also inches up one to No. 2 country and five to No. 14 pop in its 81st chart week. Dolly is among the artists who have donated items for the 27th annual YWCA Celebrity Auction in Nashville, which has been hosted for the past several years by Martina McBride. The auction takes place at Hall of Fame Park behind the downtown Hilton at 11 a.m. Sunday and lasts until 3 p.m. The event routinely raises in excess of $200,000 for the Middle Tennessee chapter of the organization. Sony Legacy has announced a June 15 release date for a limited edition "3.0" version of the label's originally two-disc set The Essential Dolly Parton. 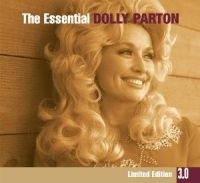 As with others in this re-issue series, the new The Essential 3.0 Dolly Parton features a third disc with additional songs not included in the earlier version. No track listing is available yet, but the 2005 version had 37 tracks on two discs (covering mostly her recordings on RCA with a track or two each thrown in from her time at Monument, Columbia, Warner Brothers and Sugar Hill/Blue Eye Records), so the new one likely has 55 or 56 cuts. You may reserve your copy here! Yes, additional galleries by correspondent Harrell Gabehart have been added from Dolly's Nashville flood relief weekend to that section of the site here, and we're not done yet! If you come to Dollywood on Friday to check out Dolly opening the annual KidsFest, you might end up on TV, as a crew from NBC's Today show will be filming around for a story on its 25th anniversary, the park announced on Facebook Wednesday. An Athens, Ga., band is getting noticed for a new male-lead version of Dolly's "Jolene." Venice Is Sinking covered the song on its upcoming Sand & Lines: The Georgia Sessions album available for pre-order here. Take a listen on a preview page from MySpace here, and read reviews from blogs Battlemouth here and Adequacy.net here. The Tennessean on Wednesday had to run a correction noting that Dolly owns her own store. An earlier story referenced a man as "owner" of her Dolly Parton's Trinkets & Treasures store but the correction here clarified that she "holds majority ownership interest" in the enterprise. With less than a week before Dolly's next scheduled visit to Dollywood on Friday to open KidsFest, your Dollymania coverage of her most recent appearance to raise money for Nashville flood relief continues with shots by site correspondent Harrell Gabehart of her Sunday morning stop by the Kingdom Heirs' show. Enjoy them in that section of the site here! The Very Best Of Dolly Parton, Vol. 1, the overseas greatest hits collection from 2007, loses eight this week to No. 15 Down Under, in its 58th week on the Australian top 20 country chart. And Sony U.K.'s three-CD "Original Album Classics" reissue of Dolly's Eagle When She Flies, Slow Dancing With The Moon and White Limozeen from a month ago sold enough copies last week to debut on the top 20 country albums tally overseas this week. The collection comes in at No. 18 in its first week on the British country chart. The CMA Festival (formerly Fan Fair) soon opens, and many in Music City are hoping it will help with losses due to the recent flooding, including Dolly's own Trinkets & Treasures store downtown. Check out a story from The Tennessean here. In related news, Dolly Records will once again have a booth at the festival to sell Dolly's products. It will be located in the Convention Center. TLC has released the third season of 18 Kids And Counting on DVD, including the episode "The Duggars Meet Dolly," when they travel to Pigeon Forge and get to sing with Dolly. Get your copy here. Oklahoman-born singer Audra Mae, the grand niece of Judy Garland, has put out a new disc featuring a piano ballad cover of Dolly's "Little Sparrow." Read a review of The Happiest Lamb from The Oklahoman here and get your copy here. Sorry for the lack of updates the past few days. My California hotel's Internet service for some reason would not allow me to connect to the site while I was there. Next on the travel itinerary: Dollywood to see Dolly's Friday appearances to kick off KidsFest, which might result in another brief hiatus depending on Internet availability during that trip. Your Dollymania coverage of "Dolly Helps Nashville" continues with a selection of shots from correspondent Harrell Gabehart from Dolly's May 23 appearance with the Kinfolks at Dollywood's Backporch Theatre. Check them out here. In related news, coverage of Dolly's flood relief donation continued Thursday with a second story in The Tennessean here, one on Great American Country (GAC's) website here and Nashville TV station WKRN here. Dolly's July 3 Hallmark Channel special snagged a mention in the network's summer programming from Hot Indie News here. Under Great White Northern Lights, The White Stripes' live CD with a cover of Dolly's "Jolene," falls off the 25-position soundtrack albums charts in the June 12 numbers Billboard released Thursday, dropping from No. 21 the previous week, its 10th on the tally. Steve Martin's The Crow - New Songs for the 5-String Banjo, with a Dolly appearance, loses two to No. 6 bluegrass albums in its 66th chart week. Lady Antebellum's Need You Now holds onto the No. 1 country and rises two to No. 4 pop with 46,000 copies sold in its 18th week, while Brooks & Dunn's #1s ... And Then Some shoots up eight to No. 2 country and 50 to No. 18 pop in its 35th chart week. Wonder what an author's reaction is to being included in Dolly's Imagination Library? The San Francisco Gate spoke with children's writer Susan L. Roth and she talked about it here. Wearing a bright yellow outfit she noted was her "sunshine" in an attempt to ward off any return of massive rains, Dolly on Wednesday presented a supersized check for a supersized amount to help the victims of Music City's May flooding of the Cumberland River. The $250,000 donation was turned over to the United Way of Metropolitan Nashville's "Restore the Dream" Fund. "I'm just so proud of everything that's been done," Dolly said in a press conference where she announced the total raised from online gifts of nearly 220 fans and net admission proceeds from two days at Dollywood, Dollywood's Splash Country and Dixie Stampede. She thanked the mayor for the job he's done handling the flood's aftermath and said she chose the United Way to ensure the money goes directly to families who lost so much in the flooding. Noting once more that Mayor Karl Dean shares the same name as her husband, Carl Dean, she joked that she's "married to the mayor" and that Gov. Phil Bredesen, a staunch supporter of her Imagination Library project statewide, is her "boyfriend." She also noted that the previous weekend was her 44th wedding anniversary with her real husband and she hopes her friendship with the mayor lasts that long. In a media Q&A, she was asked if she has toured the flooding, and she explained that she and her husband drove through the aftermath and "we could not believe our eyes at some of the people who just absolutely lost everything." When someone in the room's mobile phone began to play a ringtone, she cracked everyone up by dancing to it. Watch the full 10-minute press conference (and about 13 minutes of pre-conference prep) in the media player above courtesy The Smokies.tv. Additional coverage is available from Nashville TV stations WSMV here and News Channel 5 here, The Tennessean here, Knoxville News Sentinel here, Knoxville TV station WBIR here and AOL's country music blog The Boot here. In related news, check out several galleries from her fund-raiser appearance at the Stampede on May 23 from Dollymania correspondent Harrell Gabehart that have been added to the "Dolly Helps Nashville" section of the website here including the image of Dolly at upper left. PIGEON FORGE, Tenn.--(BUSINESS WIRE)--Dolly Parton will present $250,000 on June 2, 2010, in Nashville to Mayor Karl Dean and United Way representatives, with the money specifically designated by Parton to aid Nashville-area flood victims who are restoring and rebuilding in the flood's aftermath. After much consideration, Parton decided to donate the funds raised during her Dolly Helps Nashville event on May 22 and 23 to the United Way's Restore the Dream Fund. The donation includes net admission proceeds from Parton's Dollywood and Dixie Stampede properties in Pigeon Forge, Tenn., as well as fan contributions to DollyParton.com. "My husband took me to see the damage done by the flooding, and I was absolutely unprepared for what I saw," Parton said. "I knew right then and there that something had to be done to get those families who'd lost everything back in their homes. And that's what the mayor, the other Karl Dean, and the United Way have so graciously agreed to help me do. Get this money to those folks who are hurting the most." The United Way's Restore the Dream Fund was established to assist nonprofit organizations throughout Middle Tennessee recover and resume operations in the event of a natural or man-made disaster. The fund is managed and administered by United Way of Metropolitan Nashville. The Restore the Dream Fund will specifically work with Family Resource Centers to meet the needs of those hardest hit. In addition, none of Parton's contribution will be used to cover the agency's administrative fees. "I know that it's going to take a lot of effort and hard work and money to reverse the damage," Parton added. "I know, too, that folks in Nashville have been great supporters of Dollywood and Dixie Stampede, so I wanted to let them know that we understand that they are suffering, and we're here to help like good neighbors should. As my Dollywood theme park marks its 25th anniversary this season, we're celebrating the dreamer in everybody. I think it's really fitting that we can work through the Restore the Dream Fund, and, with this contribution, help bring dreams and hopes and peace of mind to my fellow Nashvillians." The Knoxville News Sentinel on Wednesday provided readers with a great overview of Dolly's Imagination Library literacy program on the occasion of its 15th birthday in the local Sevier County, Tenn., community. Read the piece here. Your webmaster is off Thursday evening to sunny Los Angeles to attend a family wedding and be interviewed for the documentary Hollywood To Dollywood by the Lane Twins while in town (if you haven't watched it yet, check out their teaser for the film here). I'm not exactly sure yet what my schedule holds, so I'm apologizing in advance if there is a night or two that lack updates while I'm in California. And quickly upon my return back to Ohio next week, it will be down to Tennessee to cover Dolly's appearances on June 11 for the opening of Dollywood's KidsFest, which should include the presentation of the 25 millionth book in her Imagination Library. Don't forget to tune in online at noon Eastern (11 a.m. Central) Wednesday to see the announcement of how much money for Music City flood relief Dolly was able to raise through last month's weekend at Dollywood. Dolly will present a check representing proceeds from her "Dolly Helps Nashville" effort at a press conference at her studio on 12th Avenue in Nashville with Mayor Karl Dean (not her husband, she often notes) on hand. It has been revealed that the donation will be presented to the United Way of Metropolitan Nashville's "Restore the Dream" Fund to benefit those impacted by the flood/ The public is cautioned that this is an invited/media-only event � any fans who show up will not be admitted to the press conference due to space limitations. However, you will be able to watch it online live at DollyParton.com and the Smokies TV (there was also an embedded media player above for live viewing on Dollymania). Dolly is fond of saying she has "no taste," but bad taste icon John Waters would beg to differ. Interviewed by The Washington Post here about his new book, he railed against those without taste, deploring "'hair hoppers,' as he calls anyone gussied up as a show of gaudy opulence." But when Dolly and her big wigs came up, he corrected that she was not in bad taste. Instead, he noted, "She's a female female impersonator. She's different." The director has in the past referred to Dolly's look as "drag" but has also on more than one occasion complimented her acting abilities and said she could win awards if she'd take on dramatic roles. He eschews the spotlight, so the attention is probably not appreciated, but it might have been this week's repeat of her Joy Behar interview or last month's Oprah appearance causing Internet searches for Dolly's hubby, Carl Dean, to dramatically increase recently. Online watchers BuzzLab noted the trend here Tuesday. Did you know there's a Facebook campaign to get Dolly on the cover of French Vogue? "Like" it here. Dollywood's Splash Country on Thursday is participating in "The World's Largest Swimming Lesson" at 10 a.m. Eastern. The park is one of many locations worldwide offing swimming lessons at that time in an attempt to break the Guinness World Record and spread awareness of the importance of teaching children how to swim as a prevention of drowning. Coverage of the "Dolly Helps Nashville" appearances at Dollywood from the other weekend continues tonight with a selection of audio files from Dolly's various appearances as well as your Dollymania Video News Report, which have been added to that section of the site here. Don't forget that she'll announce on Wednesday the total raised from the effort, and you'll be able to watch it live at noon Eastern here. The re-issue of the classic Dolly albums Fairest Of Them All and Sings My Favorite Songwriter: Porter Wagoner on one CD has been delayed two months to Aug. 17, it was revealed Monday. As was reported by Dollymania a week ago, Australian label Omni Recording Corporation will release the albums with the bonus tracks "Everything's Beautiful (In Its Own Way)" and "Just As Good As Gone." They had previously been scheduled for release next week. Reserve your copy of the collection here! Also delayed to Aug. 17 is the Porter Wagoner double CD What Ain't To Be, Just Might Happen and Sings His Own, featuring two Dolly-written songs on the first album (plus three of the six bonus tracks were also written by Dolly).